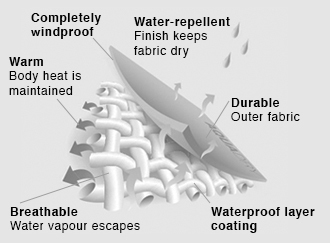 Guaranteed waterproof and breathable fabric. Waterproof, breathable, taped seams and water tight constructions. Designed for moderate to heavy downpours. A combination of our waterproof and breathable coating and our technical outer fabrics delivers guaranteed levels of protection and comfort. The outer face is treated with a DWR (Durable Water Repellent) ﬁnish to help keep the outer fabric drier for longer. The ﬁnal product provides guaranteed breathability and all-round waterproof performance.